As garden educators, we MFC staff have the opportunity to work with students in their school gardens every fall and spring. Here are some of our thoughts about getting kids involved in gardening! Even as an adult, gardening is all about experimenting and learning from your mistakes. Giving your child the framework and support to garden successfully, then letting them make choices about what they want to grow can help them gain a sense of independence and responsibility. Let kids choose what to grow in the garden, and give them ownership of the whole process, from planting to harvesting. You can provide some guidance when it comes to watering, weeding, and knowing when to harvest, but let your child do as much as possible. 2. Provide places to play! A child’s gardening experience is as much about playing in the dirt, exploring the environment around them, and sensory experiences (especially for the youngest gardeners!) as it is about growing productive fruit and vegetable plants. Make sure there’s room for experimentation, digging, and creative play. A mud pit, living arches, fairy gardens, and hideouts are just a few ideas for kid-friendly garden play opportunities. An opportunity to teach math and measurement as well as gardening skills, square-foot gardening involves dividing garden beds into square-foot sections with string or other dividers, then planting each square foot according to each plant’s spacing needs. Square foot gardening may make it easier for little hands to reach planting areas than planting long rows of crops. 4. Grow food they like and can harvest themselves! Finding the ripe fruits and vegetables in the garden (and eating them right off the plant!) can be like a treasure hunt for young produce seekers. Some easy-to-pick fruits and vegetables include: raspberries; strawberries; herbs like chives, mint, dill, and basil; green beans; sugar snap peas; cherry tomatoes; ground cherries; Mexican sour gherkins, greens, such as lettuce, spinach, or kale; and many more! 5. Grow fun and unusual varieties! Mexican sour gherkins, which kids can harvest themselves and pop in their mouths as a ready-to-eat snack, taste like sour cucumbers! Pick out some colorful, extra tasty, or interesting-looking heirloom varieties to increase your child’s interest and delight in watching the garden grow! Plant a few colorful flowers to beautify the garden and attract pollinators for your child to observe. The artistically inclined may enjoy making sketches or watercolor paintings of their vegetables or garden plants. 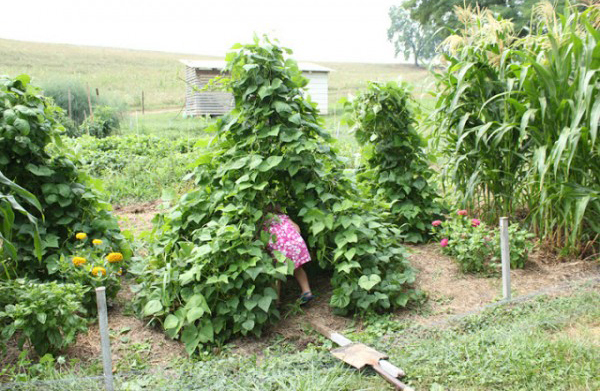 What are your tips for gardening with kids? We’d love to hear them! Emily joined the Midwest Food Connection team in March 2015. Previously, she taught kids about nature, the environment, and sustainable agriculture in a variety of settings, including at nature centers, city parks, a national park, and an educational farm. In her free time, Emily enjoys riding her bike, playing violin, gardening, and cooking.